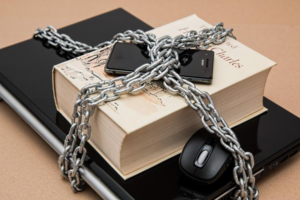 An asset protection trust is legal document called a “trust deed” that allows for items of value to be held, under the terms of the trust, by one or more trustees. In general, the trustee is duty-bound to carry out the intent of the settlor and act in a fiduciary capacity for the trust beneficiaries. 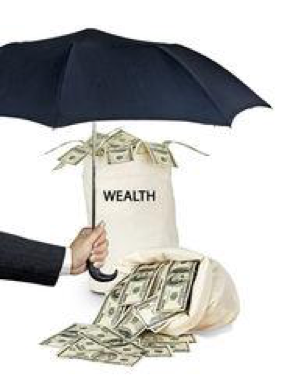 The purpose of an asset protection trust is to keep assets out of the hands of creditors. We compare both offshore and domestic options. These types of trusts are available in several US states, such as Nevada, Delaware and Alaska. Foreign countries, such as the Cook Islands and Nevis, offer some of the most protective statutes. To get straight to the point, when you look at Offshore vs. 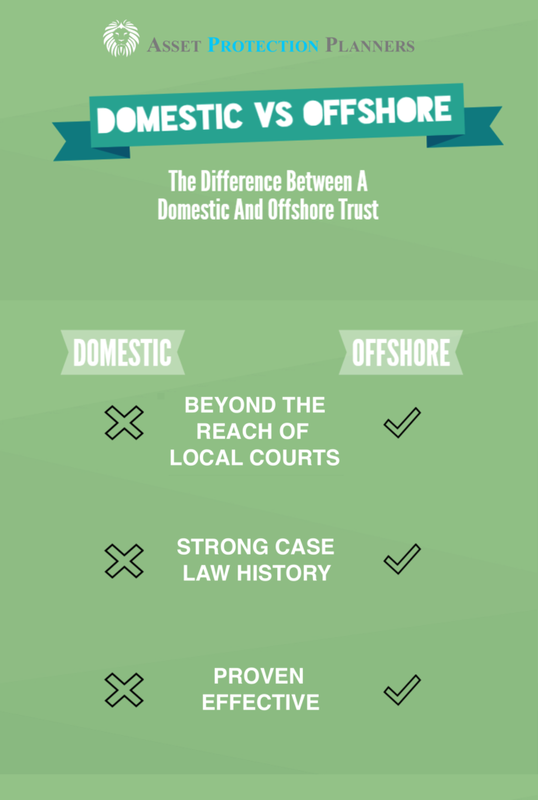 Domestic trusts to shield yourself from lawsuits, offshore wins hands down. That is because your friendly neighborhood judge has the right to issue court orders to domestic trustees. That privilege is not granted to members of the local judiciary for offshore trusts. The trustee in the foreign jurisdiction is not obligated to comply. Assets placed inside the trust can be kept beyond the reach of the creditors of the trust beneficiary. The beneficiary is typically the one who has the right to receive the money from the trust. A creditor is, in this instance, someone who won a lawsuit against you. The settlor is the one who establishes the trust. Here you will find more information regarding what is an asset protection trust, and how it works. When the trust is established you decide whether or not you will also be a beneficiary of the trust. There are trust that are not self-settled such as children’s trust. This type of trust is set up for the benefit of your children. Laws are crafted such that neither your creditors nor those of your children can touch trust assets. You may be able to access trust funds through obtaining a loan from the trust. Then there are self-settled trusts where you establish the trust and maintain beneficial interest in the trust. In jurisdictions such as the Cook Islands, Nevis and in US states such as Nevada, South Dakota, Delaware and Alaska you can form the trust, maintain beneficial interest, and statutorily enjoy protection from seizure. 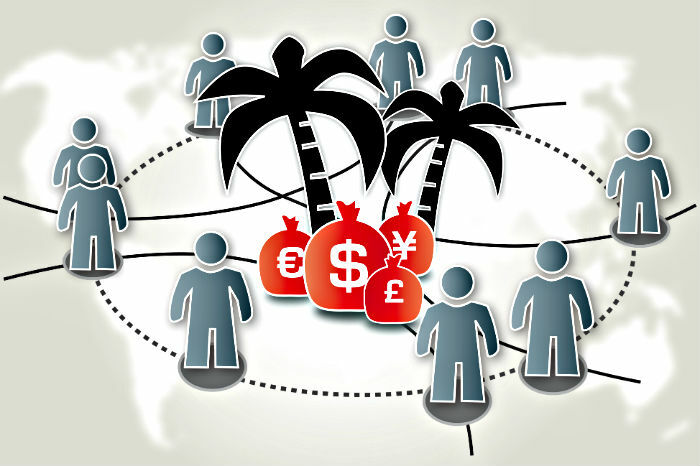 Over the past 20 years, billions of dollars have been placed inside of offshore trusts. 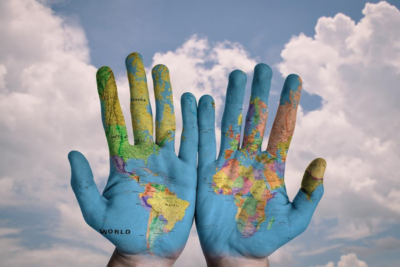 There are some choice foreign jurisdictions that have very favorable self-settled trust laws designed to protect assets. The chief of of these is the Cook Islands. In 1997 Alaska attempted to stop some of the outflow of funds and enacted self-settled trust statutes. Afterwards, Nevada, Delaware and South Dakota followed suit. Nevada and South Dakota are the two standouts with the most favorable statutes. This is mainly because the assets can be shielded in as little as 6 months (in Nevada) from the date of reasonable discovery of transfer of assets into the trust. For example, publish the transfer of assets into the trust in a small local newspaper and the assets are protected half a year later. Before these statutes went into place the only self-settled spendthrift trusts. A spendthrift trust is one in which the trustee can prevent creditors from taking trust funds. This can also keep a young beneficiary, for example, from wasting the money in the trust or spending it too quickly. The US states who enacted these statutes also did away with the rule against perpetuities. This is an old British rule that limits the trust duration to the life of the person plus 21 years. Trusts formed in Nevada, Alaska, Delaware and South Dakota can continue forever. Focusing on Nevada, here are some benefits of the Nevada Spendthrift Trust NRS 166.020. A. The State of Nevada does not impose personal or corporate income tax. B. If formed properly, a Nevada Irrevocable Spendthrift Trust is currently not subject to income taxes of other States. C. A Nevada Spendthrift Trust is only subject to Federal Income Tax. D. The Settlor can change beneficiaries, or subsequently add other beneficiaries at anytime. The Settlor does not need to notify any beneficiary past or present, the state of Nevada, or the Federal Government. E. In Nevada, the rights and privileges of a Spendthrift Trust are clearly defined by statute and do not depend on court decisions or interpretations for the validity of the Trust. F. State of Nevada does not charge registration fees, annual reporting fees or any other recurring fess charged for the Trust to remain valid. In addition, the Trusts are also not required to maintain a Resident Agent in the State of Nevada. It is irrevocable. If it was revocable (changeable), a judge could order the settlor to change the beneficiary to his or her legal opponent. It has an independent trustee (not a blood relative, controlled employee or agent of yours). It has a spendthrift clause. That the trustee needs to be someone who lives in the state where the trust is regulated. A bank or trust company that is licensed in that state can also use one. That some or all of the trust assets are in that state (such as a bank account). The trust documentation and the administration must be in the state. 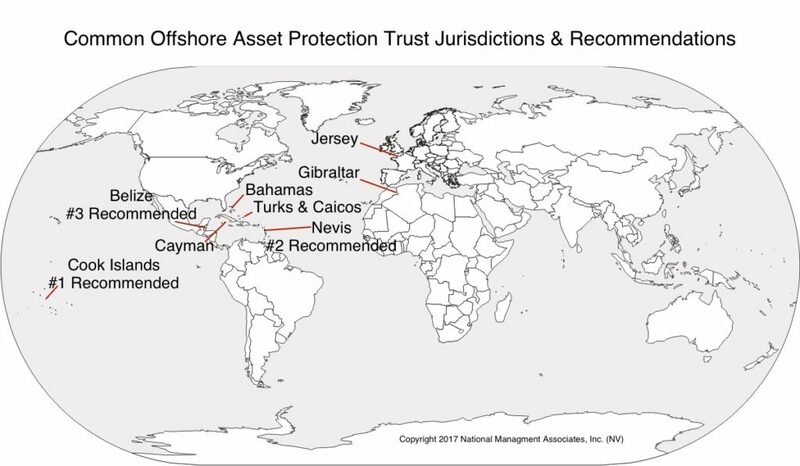 This is where the offshore trust shines above the domestic trusts. Bankruptcy is a federal action. The federal government has jurisdiction across all states. A domestic trust can survive bankruptcy with assets intact if the assets had been held in the trust for sufficient time, currently 10 years. That is because federal bankruptcy law obligates the courts to recognize exemptions provided for under various state laws. The problem is that few trusts can clear that hurdle. However, experienced attorneys will tell you over and over again, not all judges rule according to law. Many rulings are by the judge’s gut feeling about the case. Once a judgment is rendered the judgment creditor can start seizing assets of the debtor even before an appeal is ruled upon. Once assets are seized and you have no resources left to pay an attorney, it may be difficult to find legal counsel to protect and defend you for free during the appeals process. So, when there is a bankruptcy, which state’s laws apply? If the court rules that Nevada or Delaware law applies because that is where the business or real property is located, the trust will shield the assets from bankruptcy. With modern statutes there is as ten year vesting period for assets in a such a trust before they are not considered part of the bankruptcy estate. The good news is that if such a legal tool is employed properly bankruptcy can be avoided altogether. We have seen many clients avoid a harmful Chapter 7 or Chapter 11 filing. They end up finding it not necessary when their holdings are secured safely in this secure legal tool. As of this moment in legal time, the results cannot be forecast. Naturally, the judgment creditor will present arguments that support his position. The judge can rule either way. 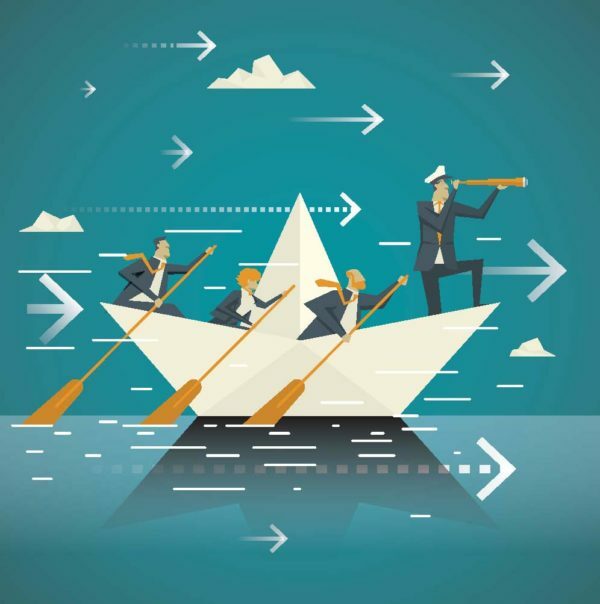 Because of the tremendous advantages offered by the Nevada asset protection trust one thing stands firm: when there are significant resources at stake, the creditor is going to challenge the legitimacy of the trust. However, if the trust is in a foreign jurisdiction such as the Cook Islands and the assets inside the trust are located in a foreign bank account, the properly drafted trust deed has proven itself worthy to shield funds from creditors time and time again. 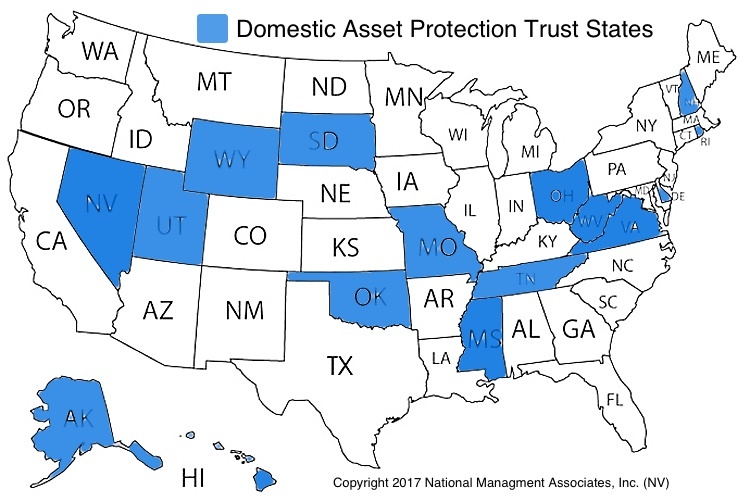 On the other hand, if the assets are located in the US, domestic assets, such as real estate, businesses and personal property, a domestic asset protection trust is one of the best tools available. For domestic real estate, whereas it is more of a privacy tool than one meant to shield assets, a land trust can work quite well to provide for privacy of ownership. We recently became aware of an unpublished Court of Appeals case in California: Kilker v. Stillman, 2012 WL 5902348 (Cal.App. 4 Dist., Unpublished, Nov. 26, 2012). Having endured attacks on the integrity of foreign asset protection trusts, in particular those from the Cook Islands, this case illustrates the vagaries of the us legal system and should be a clear warning to those same “doubters” of the potential pitfalls of a domestic asset protection planning in the U.S – particularly when measured against the well established laws of the Cook Islands. 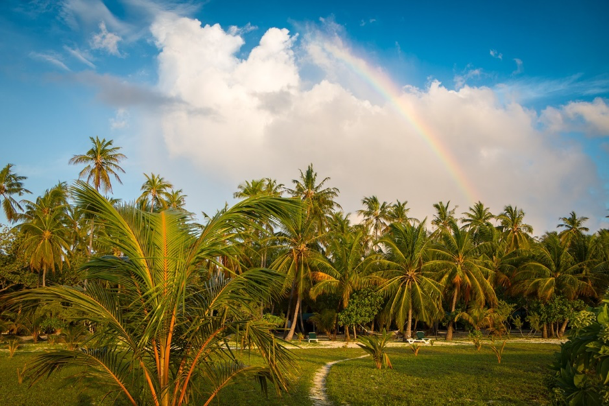 This case illustrates some important aspects that planners and their clients need to be wary of when putting in place a domestic asset protection plan, whereas the same concerns do not apply with regards setting up in an offshore foreign jurisdiction such as the Cook Islands. While the court could have invalidated the structure the debtor used under several equitable legal theories, the court in the Kilker case made a determination as to whether there was a fraudulent conveyance AKA fraudulent transfer of property under the California Uniform Fraudulent Transfers Act (“UFTA”). It was a case of a leaking swimming pool built by its Homeowners on advice given by a Soils Engineer. The Homeowners successfully sued the Engineer, and moved to enforce judgment. After the pool was installed but years before any problem with the pool was detected, the Engineer had transferred assets to a Nevada domestic asset protection trust which he established without the help or advice from a lawyer. The Homeowners alleged that the Engineer’s transfer of an office building to the Trust was a fraudulent transfer under the UFTA. The Homeowners also claimed that the Trust was the alter ego of the Engineer. The engineer occupied the office building without a lease and rent free. In other words, none of the regular commercial formalities were employed. Moreover, when asked in his deposition to give the reason why he transferred his assets to an asset protection trust, the Engineer testified he did so for asset protection. The Trial Court found that the Engineer was the alter ego of the Trust, and that the office building had been fraudulently transferred to the Trust as per the UFTA. The real kicker to the case though is that the Trial Court found that even though there was no existing “claim” at the time the Engineer made his transfers, the transfer was a fraudulent transfer because the Engineer made the transfers for the stated purpose of defeating the collection rights of unknown future claimants who might come along later. From an asset protection point of view, this judgment has far reaching ramifications. Indeed, if you’re in the business of advising on wealth preservation or estate planning for those in high risk occupations and opt for the use of domestic asset protection trusts, (in preference to a foreign trust), then you need to be, well…worried. The statute does not include the terms ‘future creditor’ or ‘future potential creditors’ . . . and does not require that, from the debtor’s perspective, a creditor who challenges a transfer as fraudulent under the UFTA to have been reasonably foreseeable as the debtor’s creditor before pursuing remedies under the UFTA. Furthermore, the statute does not require that the debtor intended to hinder, delay, or defraud the specific creditor who challenges a transfer of an asset as violative of the UFTA. On the contrary, section 3439.04, subdivision (a) provides that a current creditor can challenge a transfer as fraudulent, regardless whether that creditor had a claim at the time of the transfer, if that creditor can prove, inter alia, the transfer was made to hinder, delay, or defraud any creditor. For those who are not comfortable going offshore initially, there is a good option. It is called the Trigger Trust TM. The trigger trust is a domestic/offshore trust hybrid. You are an initial trustee, if you desire. If the legal need arises, your co-trustee can immediately pull the trigger to enact the offshore trust measures built into the trust. By comparison in the Cook Islands, there is no grey area when it comes to the issue of “future creditors” versus “present creditors”. Section 13B of our International Trust Act 1984 is very clear as to the rules to determine this important issue. We leave it to our US colleagues to interpret the effects of the Kilker v Stillman decision. But lest to say that the Cook Islands is still considered the leading asset protection jurisdiction in the world, and can boast a long line of judicial precedent which upholds the integrity of the Cook Islands International Trusts Act 1984. The bottom line is that US judges have jurisdiction over US trusts and trustees. They do not have jurisdiction over foreign trusts, trustees, and trust bank accounts held in financial institutions that do not have corresponding US branches. Time and time again experience has shown that parking funds in a properly structured offshore asset protection trust in the right jurisdiction simply works better than its domestic counterpart.